IS THE WASPS DEAL DONE? Sources close to the situation suggest that the deal to bring London Wasps Rugby Club to Adams Park is nearing a conclusion. QPR agreed a groundshare arrangement with Fulham earlier in the week and although Wasps have a ten year deal with Loftus Road PLC, this will be suspended for the period that Fulham are in bed with Rangers and Wasps will need to find a new home quickly. Speaking on a webcast on qpr.co.uk, Rangers Chief Executive David Davies said "Fulham have come out of it feeling they've got a good deal and we certainly do at our end". Davies would not reveal the amount of money involved in Fulham taking up residency at Loftus Road but did say "There are two distinct deals, there is no overlap at all. There were seperate negotiations held by Wasps over their arrangements.". Some reports suggest that Rangers will get around � for taking on Al Fayed's money men but Davies was quick to point out that Fulham will be compensating Wasps and not QPR. "They are two seperate deals and there is no cost to QPR re. Wasps arrangements and I think the figures that are being quoted of �0,000 for them to go are just down to scaremongering." Rangers deal with Fulham is initially for one year but should there be any problems with the contruction process at Craven Cottage, QPR have the ability to extend that the deal with Fulham into a second season. Like Wycombe, Wasps officials have been keeping quiet on the subject and fans of both teams are becoming frustrated with the lack of information and the carefully fed dis-information surrounding the proposals. The only firm information at hand is that Wasps are considering sharing either at Wycombe or bitter rivals Harlequins. A deal needs to be in place before the end of March to meet new Zurich Premiership guidelines on ground tenancy and fixture priorities. However, some Wasps fans have become so cynical to suggest that the deal is already done having picked up on a connection with their new sponsors. Wasps annouced a new shirt sponsorship deal in January 2002 with Generation Telecom a telecommunications company that is part of the High Wycombe based Phones International Group owned by local entrepreneur Peter Jones. Meanwhile, Wanderers lost shirt sponsors Verco earlier that month and Club officials could well be eyeing up a possible joint deal. 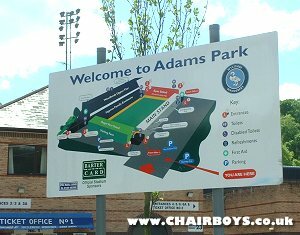 � Chairboys on the Net 2002 - www.chairboys.co.uk - all rights reserved.